I've been feeling really crappy all week with a migraine that would not let up. I believe the cause of it was do to the low barometric pressure. We had nasty tornado weather yesterday. It was warm, humid and dreary. The temperature dropped last night and created a beautiful fall day. I decided that the sun and brisk air was best for what ailed me. I wore my black, slim-fit Simplicity 2315 pants, with a Missoni for Target t-shirt, Gap denim jacket and Steve Madden wedges. I love the zipper details of my pants. And this is the first time I've worn these shoes for an entire day and they're extremely comfortable. Even though everything in me said to stay home and "take to the bed", I got dressed and got out (and bought some sale patterns... hehe!). Sun and retail therapy... it's good for what ails you! You really lucked out with the Missoni! Ours were sold out in less than 30 mins. Great outfit! Like I said before, our store was almost empty. I hope it's the same way with Jason Wu for Target! LOL Thanks! Great that you were able to get out. "Pattern Therapy" is a good thing. Feeling much better. I may even cut some fabric tonight. Thanks! You rock it as always :) so glad the headache let up. You look so chic! The ankle zippers are a fabulous touch. So glad the migraine let up. Have you ever been to a migraine specialist? Maybe there is something you could get that would be helpful next time. I don't feel I have a need to go see a specialist. I don't have migraines that often. But when I do... Whew! Thanks! You look fabulous in the pants you made, and loving your wedges. Yay for the fall weather coming out and brightening your day! Looking good. Love the shoes! Erica you are amazing ! I have regular fits of migraine (right now for instance)and believe me I am not so well put together as you are. I love the zip of your pants too. Marie-Noëlle, I felt I was looking worse than I felt! I had to get up and do something or cover every mirror in the house! Thanks! He! He! That's cute. A little retail therapy....it's so therapeutic. And I love the pants, the zippers really make it unique. Glad you're feeling better because you look fabulous! Love the slim pants. How did I miss that pattern? It's a pattern you had to be looking for. You know how uninspiring the envelopes can be. Thanks! I am a fellow natural hair wearing, fashionista who shares your taste in shoes. I have those same shoes...love them! While I do more refashioning, I am starting to spend more time on honing my sewing skills. You are an inspiration. Thank you for sharing your journey. Love the outfit and most importantly I'm glad your feeling better. Thanks! I hope you get your blog up and going soon. I can't wait to follow your adventures! you look so pretty! Love the touch of red! Love this look! 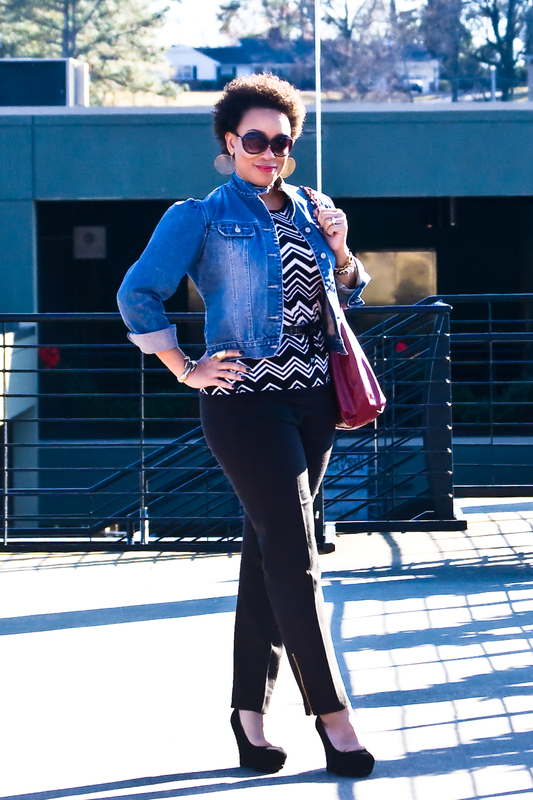 Chevron, denim, a great pair of wedges --Divine! Great look, Erica! Most of all I'm coveting your shoes... I'm on the hunt for a pair like that for ages! Thanks Tany. Those are currently my everyday shoes! I put them on with everything! What I'm Wearing: Black + Pink + Polka Dots! McCall's 2255 - Silk Crepe de Chine Midi Skirt! What I'm Wearing: Chunky Knits + Fall layering! 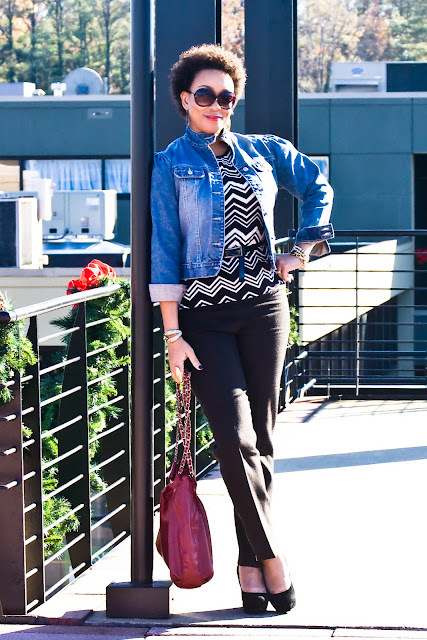 What I'm Wearing: Lady-like + Sparkle!